Tri-Mountain Gold Wrinkle Resistant Cotton Shirt - 968 Robertson  - $45.15 : Sogowear Outfitters!, Polo Shirts, Golf Shirts, Jackets, Fashion Fleece, Woven Shirts and More! Men’s 4 oz. 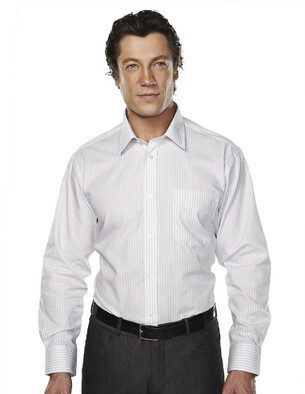 100% cotton non-iron multi-color striped dress shirt. Features fine 60-singles yarn specially treated to resist wrinkles, while maintaining an extremely soft hand feel. Medium-spread collar with collar stays, single-needle tailoring and yoke back. Left chest pocket and 2-button cuff.